A textile was originally a woven fabric, but the terms textile and plural textiles are now also applied to fibers, filaments and yarns, natural and manufactured and most products for which these are a principal raw materials. The term is now applied to fibers, filaments, or yarns, either natural or, man-made, and the products obtained from them. For example, yarns, threads, cords, ropes, lace, embroidery, nets, And fabrics made by weaving, knitting, felting are textiles. Actually it is used in the description of fibrous or filamentous manufactures and of the raw materials, processes, machines, buildings, and personnel used in the organizations connected with, and the technology of, their manufacture. The material, which consists fibrous structure and length is thousand times higher than its width is called fiber. It is also the generic term used to describe the basic element of the material from which yarns, woven, knits and other substances are made. 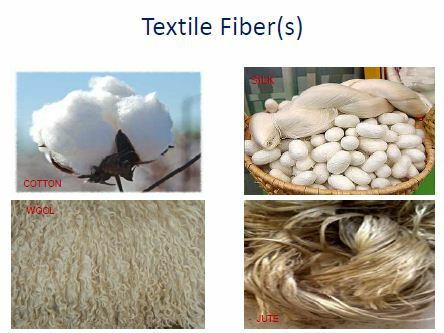 Textile Fiber: The materials which consists of fibrous structure and its length is thousands times higher than its width and which can be spun into yarns suitable for weaving or knitting is classified as textile fibers. For Example : Cotton, Silk, Jute, Hemp, Wool etc. 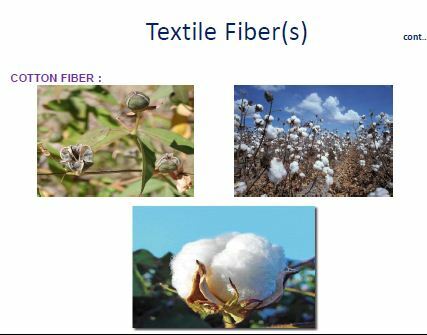 FIBER : Fibers / Staple fibers- are the fibers of limited length (1 – 8 inch approx.). To make a continuous length of yarn from staple fiber , they must be twisted together. Basically this term used for the Natural fibers. FILAMENT : Filament fibers are of continuous length (more than 8 inch and continuous). That is to say the fabrics made from filament fibers are more easier to made as the filament length are continuous. Basically this term used for the Man made fibers. Directly Comes from nature. Made from nature. The length can not be controlled. length can be controlled. Comfortable and good for health. Quite Uncomfortable and not sogood for health. It is expensive compare to MMF. It is not expensive compare to NF. We have to depend on nature forits production. For production, no dependence onnature is necessary. It is not much favorable forfinishing. It is favorable for finishing. Example – cotton, silk, etc. Example – Polyester, Nylon, etc. Length To Width Ratio : Fibrous material must possess adequate staple or fiber length and the length must be considerably higher (1000 times) then the width of the fiber. Strength of any material is determined by the breaking strength (that is tenacity strength) which express as force per unit cross-sectional area. With this term (strength / tensile strength) we may describe the ability of a bundle of fiber or yarn to resist breakage under tension / load. In case of describing the strength of individual fiber the term tenacity is usually used. The term ‘fineness’ describes the quality of a fiber. It is calculated in Micronaire value. By this, we can know how fine a fiber is. Micrograms/ inch. The average weight of one inch length of fiber, expressed in micrograms. Cotton fiber micronaire value is generally 3.7-4.2. Resiliency : This is the ability of a fiber to bounce back or return to its original shape after deformation. It can be after compression, bending, extension, etc. Flexibility : It is one of the essential property of textile fiber . The fibers should be sufficient by pliable , then only it can be wrapped around another fiber during spinning . Many substance in nature resemble fibrous forms but they are not practical fibers as they are stiff and brittle . Uniformity: This is the similarity of the fibers. Such as, if length of some fibers are same we will say uniform length, if strength is similar, we will say uniform strength. Cohesiveness: It is the ability of the fibers to cling together during spinning depends on crimp and twist. Amorphousness: Amorphous orientation of polymers within the polymer system of any fiber is called the amorphous region. In amorphous regions, the polymers are oriented or aligned at random. Crystallinity: Crystalline orientation of polymers within the polymer system of any fiber is called the crystalline region. In crystalline regions the polymers are oriented into more or less parallel order. Dye ability: It is the ability of fibers to be dyed i.e. to get colored. Behavior to Water: Water is very important to determine the properties of fibers. According to the behavior of fibers with water, fibers are classified into two groups –hydrophobic and hydrophilic. Water is used in process like scouring, dyeing. Behavior to Acid: Textile fibers and materials are subjected to acids in various processing like bleaching. The different kinds of fibers react differently with acids. The acid must be chosen properly to use different process so that it doesn’t make any harm to the fiber but brings the required change perfectly. Behavior to Alkali: Different kinds of fibers behave differently with different alkalis in different situations. For example, Caustic soda in dilute solution and low temperature dissolved the wool fibers. But no effect on cotton. The ability of a fiber to absorb moisture is called Fiber Absorbency. 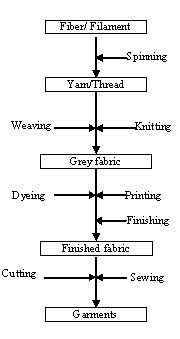 Textile fibers are subjected to heat in dyeing, drying, steaming, calendaring, pressuring and other operations. Some fibers become tough under heat such as Rayon, where as some burn under heat such as flax, cotton, jute, etc. Sunlight reacts differently with different fibers and fabrics. For example, white fabrics become faded in various degrees. Again black absorbs more suns heat than the white one.